Jon Fardink is a 59 year old man who is very ill. He was diagnosed with Alpha 1 antitrypsin deficiency a debilitating lung disease twelve years ago. His doctors at the Cleveland Clinic in Ohio have told him that his only option is a life-saving lung transplant. Jon has lived in Ashville, New York his entire life. 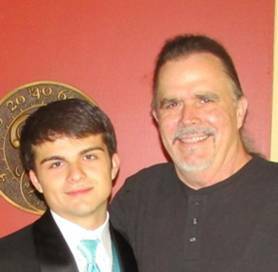 He is the loving father of his son Nicholas (17) and best friend of his mother, Tracy Fardink. He graduated from Panama Central School and eventually went on to running his own blacktop paving business. In 2008, Jon’s poor health forced him to retire. In his spare time Jon used to be a well know musician performing in a band playing benefits and doing fundraisers. Now Jon needs your help. As you can imagine, the cost of a transplant is overwhelming. Even with insurance there are many expenses that must be paid out of pocket. Some of these expenses are co-pays, deductibles, travel to and from the transplant center and Jon will need to relocate to Cleveland for at least three months at the time of transplant. In addition, he will be on a life-time of expensive anti-rejection medications. This is where your help is desperately needed. A fundraising campaign in Jon’s honor A fundraising campaign in Jon’s honor has been established with HelpHOPELive, a nonprofit organization that has been assisting the transplant community for 30 years. All donations are tax-deductible, are held by HelpHOPELive in the New York Lung Transplant Fund, and are administered by HelpHOPELive for transplant-related expenses only. Please consider making an end of year tax-deductible contribution today. On behalf of Jon and his family, thank you for your kindness, generosity and support.